Here is my final video! My video is a short comedic story about a guy who thinks he’s late for work and the only way he can get there is by riding a tiny scooter. Although it is not a silent film, I was inspired by the way silent films communicate a story without any dialogue. I chose music and title screens that mimicked those used in slap-stick comedies and silent films. I was inspired by some of the works that we looked at in the last blog post that involved clicking on different places on the screen to move around a virtual space. I thought that this was an interesting way to tell a story and I wanted to try it out myself. My story allows viewers to move around the room to look at the aftermath of an event and to read captions that hint at what happened. I always have a hard time coming up with creative stories and I know my final product isn’t very sophisticated, but I enjoyed experimenting with combining video and html to create an interactive and non-linear story. My video essay focuses on montage sequences. I only used text to create titles on the page and did not include a lot of dialogue as I struggled with the short time limit. This exercise was fun and I liked how it challenged me to try toconvey an adequate amount of information in less than 60 seconds. I first learned about the app Pry in my digital storytelling class and I enjoyed it so much that I decided to download the app again. I find the story that Pry tells to be interesting and I enjoy the interactivity of the story. The story displays text and videos on separate screens while sounds plays throughout all the screens. The sound may correspond with the screen you are currently watching or another one that you can switch to. Viewers must touch the screen in order to advance and explore the story. If they perform a “zoom-in” motion with their fingers, they will see the main character James’ view of the world around him. If they perform a “zoom-out” motion, they will see James’ inner thoughts and flashbacks. There are also times when viewers must swipe their finger across the screen to touch braille dots on the screen, which causes the character James to read a short story. The interactivity in this story allows viewers to become immersed into the story and James’ mind. Pry and many of the other works from the list are narrative, but some are more abstract. Like Pry, the Dreaming Method stories The Flat and Last Dream tell stories by allowing viewers to interact with the piece and the viewers advance the story by clicking on different objects of the screen. Viewers move through a digital space and uncover more information about each story by visiting different rooms and visiting specific spots in those rooms. Seances by Guy Maddin was unique from the others as it required very little action. This story was similar to a short film and told the stories of different characters. This piece was eerie, used glitch art, and was reminiscent of old silent films. I was a little uncomfortable while watching this piece because I do not handle scary movies well and it reminded me of a scary movie, but it kept me very engaged and I watched it until the end. The assigned videos were excellent examples and explanations of video essays, and they made me excited to explore this form of communicating. Essays can be highly informative but long essays may not hold an audience’s attention and the medium of writing may not be illustrative enough to fully explain every possible topic. 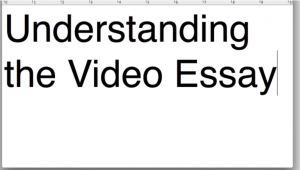 Video essays are interesting and they combine graphics, sounds, and narration to explain or analyze topics in new way. Standard essays can explain how something is done but a video essay can show viewers how something is done while explaining the process, which is more powerful than the standard essay’s explanation if it’s done well. If I were to make a video essay, I would start by considering what I want to discuss in my essay and what footage would illustrate this topic. For example, if I want to discuss how to effectively use a montage in a movie, I would make a list of movies with excellent montages in them and then find footage of those scenes. I would then begin writing what I want to say about montages and form my discussion as I would when writing a standard essay. I might start with my thesis and then discuss my main points and supporting evidence, such as the montage scenes that will be shown in the video essay. I think video essays are an interesting way to share information and I am excited to make my own. My final project will be a short, comedic video that uses both continuity editing and montage. My story will be about a guy who wakes up late for work and rushes to get ready. He soon finds that his car will not start and that his second mode of transportation, a bike, has a flat tire. He must choose an unconventional way to get to work and either rides a scooter or roller blades (depending on which my actor can ride) to get to work. When he finally arrives at work, the door is locked and realizes it is actually his day off. This short video will not include any dialogue because I am not good at writing dialogue and none of my friends are good actors. In the next few weeks I need to finish writing the script and storyboard, decide where I will film, and choose a day to film. I have already found an actor for my video and he agreed to give feedback on my storyboard so that I know what acting skills he has and which scenes he will be able to do before we start filming. After exploring the SKAM Austin Facebook page and reading the article about it, I was very interested in the idea of a networked tv series using social media. I think the stories told in SKAM are interesting to teenagers and using different social media platforms was a genius way to keep them engaged. I like how they were able to create older posts and share new ones to pull viewers into the story. The characters are clearly portrayed by actors but by sharing posts about them outside of the edited videos, the creators of SKAM have added an extra dimension to the story that makes it feel more real and immersive. The writers for SKAM are far more creative than I am and I can not think of an original story that would be an interesting networked series. I have not seen the movie Searching yet but it looks interesting and based on what I know from the trailer, a similar story could be told through a networked series. The creators could create social media accounts for the missing daughter that include hints about what she was doing behind her father’s back. Her friends could also share more details into her secret life and the Facebook page could share videos similar to the video-chat recordings from the movie trailer. I would really appreciate any suggestions on how to fix my audio. The part where Mel explains that he was run over by a charter boat and why he bought his saw mill were only recorded on my phone unlike all of the other shots which were also recorded on an external microphone (he started talking before I could hit record) so the two pieces of audio don’t flow well together. I’ve tried to edit out the wind in the background by using audition but I wasn’t able to do that very well. I love this video, I work with wood myself making signs and shadow boxes but nothing like this. I would love to work with this man he seems like a wonderful person to know. Great job. I love the opening shot – it is great as an attention grabber. I was very curious to find out what he was doing! He sounds like the kind of guy who could talk all day and I’d be interested haha. Love seeing all the different shots of him running the equipment, love that you switched up the compositions of the interview so it wasn’t the same the whole time. I feel like the audio could use some tweaking, maybe it would sound better if you left some of the noise in? I know how rough it can be to edit that stuff and it was probably a very noisy area, so it’s not a big deal. Maybe it just needs some music or something? You did a fantastic job with the narrative arc. The story flows perfectly! This was very entertaining. Mel is a badass, I hope I’m as cool as he is when I get to his age. While there are lots of great shots of him working in the wood mill, I would have loved to see some shots of him and his motorcycle, maybe a picture of him when he was younger as he’s talking about being in the San Francisco Bay, and a montage of the house he’s talking about when he’s telling us how every single piece of wood in his house came from his saw mill. Also some of the audio has hissing and some of it doesn’t, which was distracting for me. But overall very cool subject and your video have a very strong sense of setting! Your shots are BEAUTIFUL!!! I do wish there was just a bit more variety other than the interview and the saw- maybe a shot of his house he built or a piece he’s built on the sawmill? And I love the subject. I definitely hear what you mean about the audio- for what it’s worth I feel like you’ve done a great job for what you had to work with. Maybe leaving some of the background noise or adding a music track might help tie it all together and feel less choppy? The opening is very engaging. I am glad you didn’t start the voice right away. But when you do bring in his voice, I don’t think you need to cut to him sitting. We can keep watching him at work and then later show him sitting at .22. Too bad about the sound. In those situations, you might jump in and ask him to repeat with the mic on. Beautifully shot and a great, interesting subject. For my hybrid space video I placed pieces of green poster board inside my desk drawers and filmed somebody opening them. I was trying to create the illusion that inside each drawer was a miniature world. The videos look a little cheesy but I adjusted the size of them the best I could to make it look like they naturally fit inside the drawers. What a clever idea!! I love this. I love this, can you show me how you did this. My six year old and I were watching this and he said , daddy daddy daddy can you show me how to do this. Very creative, GREAT JOB!!! Thank you so much! I cut out pieces of green poster board and placed them in my desk drawers. I then shot a video of someone opening each drawer and put it into Premiere. I followed Will’s instructions from class to replace the green screen and it was pretty easy! You just add the effect “Ultra Key” to the video and use the color dropper to select the green paper. If you place another video on the line below the one containing the green paper, that video will appear in place of the green paper. I found this short video that explains it a little better than I have- https://www.youtube.com/watch?v=83xu5j_9BsE . I wish I had known how to do this when I was six because my sister and I would’ve created so many videos with it. I hope you have fun making a video with your son! Thank you so much. I am spending the weekend making some crazy ninja movies with this kid. we are going to try to create a fight scene in the refrigerator. “Light is Waiting” by Michael Robinson is an interesting project that shows scenes from the TV show Full House that have been heavily edited. A scene plays at the same time as an inverse version of the scene is displayed, which creates a mirrored effect on the screen. The space depicted in this video isn’t a real physical space because the characters are shown in two different places at once and that is impossible. According to Lev Manovich, “cinema traditionally involved arranging physical reality to be filmed” but it now involves editing and manipulating recordings to create a final product. The indexicality of traditional cinema has been manipulated and challenged in this video by Robinson because this video does not truthfully capture images of characters in our world. Robinson mirrored the images in the original video and added hypnotizing colors to create an eery kaleidoscope effect. The characters’ voices have been warped and slowed down in a way that one would not be able to produce by capturing truthful footage of the same lines of dialogue. While this video made me very uneasy, I enjoyed how Robinson layered the images in the video and it made me think about how I could use similar effects with different videos. This video made me want to experiment with different layering effects to create a video with mirrored images that creates a surreal feeling. Melissa Eldridge and Evelyn Smith’s practice assignment from October 2nd. I created a spatial montage about a night without sleep. I think that showing different actions on the screen at the same time conveys the restless feeling of not being able to fall asleep at night. I had a new clip start after the previous clip in the other frame was about halfway done so that viewers can understand what is happening in one frame before paying attention to another. I only used two frames and made them the same size because I wasn’t using continuity editing to carry an action between the frames. I thought that it would be easier to understand the montage if there were only two frames to watch because the actions in each were separate from each other. Really good rhythm with the editing between panels. If I were to make a documentary about the Eagle Creak fire, I would focus on the fire’s destruction and its impact on the local community. Some of the people I would interview include families that were forced to evacuate due to the fire and hikers who frequently visit the area. As Barry Hampe explained on page 119, interviews can be a great way to document an event that was not recorded on video. There may not be footage of families evacuating their homes and packing their belongings into their cars, but an emotional interview with someone who can recall what that day was like would definitely provide evidence for this story. Hampe also discussed the importance of filming interviews in effective locations on page 98. According to Hampe, if someone is discussing an issue then the interview should be filmed in a location associated with this issue. These interviews could be filmed outside of the subjects’ homes with the trees in view to show that they live close to the part of the forest that was destroyed. Not only would interviews with people effected by the fire be important to include, but visual evidence would be key in telling this story. I would include footage of various hiking trails that have been closed since the fire broke out, as well as shots of burnt and downed trees. I might also film the interviews with local hikers near the signs that state which trails are closed so that the disappointment in their voices during their interviews matches the surroundings that shows the source of their disappointment. The articles by Barry Hampe made me consider the different ways that I could use visual evidence to effectively tell the story of the Eagle Creek fire without relying solely on interviews. This loop shows someone playing checkers with the other player sitting out of frame. I used continuity editing to give viewers a closer look at the person moving the checker piece. While it does not loop perfectly, I think it creates a timeless feeling as he continuously fiddles with a checker piece before moving another one and placing it in his pile. I wanted to create a rhythmic montage of myself making tea. I used the assignment’s suggestion to stretch time by placing a 2-seconds long clip in between two 3-seconds long clips. I think the loop could be improved by adding another clip at the end that shows someone drinking the cup so that when the video loops, it looks like someone is making another cup of tea and the cycle repeats infinitely with each loop. I recorded a video of a vinyl record spinning to create an infinite loop. Like my continuity loop, this loop has a timeless feel as the record keeps turning and the turntable’s arm does not move towards the center of the record. Continuity editing was used throughout the movie Run Lola Run, as well as cross-cutting. When Lola is changing the ending to the movie and is running towards the bank her father is in, the scene cross-cuts between Lola running and her father inside his office with his mistress. According to the readings in Rombes’ book, this movie has a digital aesthetic as it doesn’t have the imperfections associated with movies recorded on film. On page 9, Rombes says that these imperfections include “missing frames, pops, hisses or graininess.” This movie has a digital aesthetic because of its clear images and concise editing. This movie’s temporal arrangement of the story is different from a standard Hollywood movie because its main character rewrites the ending multiple times rather than following the same narrative until the end of the movie. On page 74, Rombes explains that this movie uses “the process of nonlinear editing itself, whereby shots and sequences are pieced together in potentially endless configurations, each one telling a slightly (or drastically) different story.” This is not something we see in most Hollywood movies as time usually follows a linear structure. Despite its use of nonlinear editing, Run Lola Run uses similar editing techniques as the classic Hollywood style, such as continuity editing. The movie also avoids breaking conventions such as the fourth wall as characters do not directly address the audience or acknowledge that they are in a movie. Time is stretched in the movie as Lola runs from her apartment to Manni in only 20 minutes but this part of the movie is longer than 20 minutes for viewers. Time is compressed when Lola rewrites the ending of the movie as each time she starts over, the shots of her running are shorter. Narrative continuity is maintained each time Lola starts over even though time is being manipulated because she still follows a similar sequence of events. This is my temporal montage that shows me getting ready for a movie night. My montage is a metric montage as each shot is just 3 seconds long. This was my first time making a montage and I struggled to show the passage of time without using continuous shots. I made every shot the same length no matter what was happening because I did not want to show exactly what I was doing. I wanted to use short shots to give viewers the sense that I was preparing for a relaxing night at home without using long shots to show every detail. This is a wonderful montage because of the metric montage AND a clear narrative line. Great. These GIFs express time in an interesting way as they all make the activity being shown seem endless. The third GIF originated as a video from the show Seinfeld and shows the character George eating popcorn. This GIF is seamlessly looped so it seems like George could sit there forever without running out of popcorn. The second GIF of the tunnel also portrays the passage of time in an interesting way because no matter how much time passes, the scene does not change and it makes viewers feel like they will never get out of the tunnel. The GIF of the dog shaking water off itself creates a similar feeling for viewers. The area around the dog does not change and it makes it look like time has stood still. Loops hold a lot of potential as story telling devices. Loops can be used to convey a moment in a story where time feels endless or an action seems like it will never end. If a character is upset and wants to get far away from someone else, one could use a loop to show someone running for an infinite amount of time. A loop can also be used to describe a moment where time seems to stand still, as it does in the GIFs I described above. If you want to describe a moment where someone receives bad news and they tune-out to their surroundings, you could include a loop of someone looking shocked. If the background of the loop does not change and the character’s facial expression can be looped seamlessly, the GIF will have a timeless feel and convey time standing still. My video tells the story of my boyfriend Geoff baking cookies. I felt that this was a good activity to film because it involves a lot of steps and takes more than 60 seconds. Although it can be a lengthy activity, the video was easy to shorten while maintaining continuity throughout the story. There are a few aspects of the framing of this video that I think work well. I think that I chose a good variety of angles and distances in my shots. I think that it was a good choice to do a medium close up of the kitchen timer as it dings because it shows the oven in the background but keeps the timer the focus of the shot. I think the shots that focus on Geoff standing at the kitchen counter work well because they are at different angles and the variety helps hold viewers’ attention. I think that the extreme close up of Geoff setting the timer is a little awkward because it is close to his hands and it doesn’t feel natural for him to set the timer down so that it faces away from him. I struggled with how to stage this shot because I didn’t want to stand behind him but I wanted the timer to sit in that spot so the oven would be in the background when I stepped further away for the next shot. I reviewed the video I made for last week’s assignment and tried my best to not repeat any continuity mistakes. I ensured that items that were placed in a certain spot in one shot were not unexplainably in a different spot in a later shot. I forgot to shoot my establishing shot until I started editing my videos and had to go back to my kitchen to get that shot. I rewatched the videos that I captured to make sure that everything was in the right spot. I also had continuity in mind as I was editing the shot in which Geoff places the cookies in the oven. Instead of ending the shot when Geoff closes the oven door, I show him walking out of the frame and off to the right because that is where the timer, which he uses in the next shot, is sitting. A possible continuity issue that I have seen in my video is that the second shot is of Geoff kneeling behind the counter grabbing the cookie pan and the next shot is of him standing by the fridge. Although he sets the pan above his head in the second shot and you can see it in the background in the next shot, the spot behind my counter is not well established in this video. Unless a viewer has been in my kitchen and knows where that place is, it may not be very clear that he was standing below the counter where many other shots were filmed. So there are only a few continuity edits in this. Most are discontinuous. That doesn’t mean I am confused about the action or where the subject is, but the cuts are mostly jumps cuts. This a perfectly valid and popular style on youtube, but I want you all to understand true continuity that uses the action of a subject to change camera angles. I will make it clear in class. Scott McCloud’s visual essay discussed the many ways comic artists can depict time and movement in comic panels. On page 100, McCloud said that comic panels that do not include movement or speech bubbles may be used to depict a character pausing for a few seconds. I was interested in this section of the chapter because I had not considered how comic artists must use images to manipulate time. These artists put a lot of thought into how they should show that time has passed, and readers usually understand that time has passed without giving it any thought. This part of the chapter made me think about the different aspects of film-making that make depicting the passage of time both easy and difficult. Movies almost always take place over an amount of time that is longer than the movie’s duration. This forces writers and editors to condense the time it takes to complete certain actions, as well as omit some altogether. That is, unless it is important to the plot of the movie or it has to do with the advancement of the story, a movie will not show characters sleeping. When a scene begins with the start of a new day, we do not need to have seen the characters sleeping to know that they have slept and that the previous day is over. We discussed in class how some conversations in movies may be shown in real time, but they often exclude the silent pauses between lines of dialogue that happen in real conversations. This allows a scene to be shorter than it would be in real life. As I read this part of the chapter, I also considered how filmmakers can manipulate time in a way that makes a lot of action happen in just a few seconds. For the characters of a film, time may stand still but time continues for the viewers. An example of what I mean is in the movie X-Men Apocalypse. In this drawn-out scene, the character named Quicksilver can move so fast that he is able to accomplish a lot in what feels like only a few seconds for the other characters. Viewers watch this seen for almost three minutes but the movie’s plot advances by only a few seconds. The writers have manipulated the way time passes in this scene to accentuate the character Quicksilver’s powers. This is my video for this week’s “Framing for visual evidence” assignment. I used various types of frames to show the aftermath of someone using the last of the milk and leaving the empty jug in the refrigerator. The first shot is meant to show someone sneaking away after placing the empty jug of milk in the fridge. I then showed the evidence of who did it by showing the mess they created on the counter. I ended on an extreme close up of the culprit to clearly show the bowl full of cereal as well as to hide his identity. We discussed in class. Great framing and storytelling. Just the question of the open fridge. In this scene from the movie Close Encounters of the Third Kind, the woman is trying to close all of the entrances to her home before aliens can get in an abduct her child. This scene is held together through the match on action. That is, the camera cuts to a new shot when a character moves or performs an action. When the mother moves to kneel in front of the fireplace, the camera moves to a close up in front of her face. This scene also works well because it cuts between shots showing the mother’s distressed face while trying to close the door in the fireplace and shots of her hand inside the fireplace. The shots that pan down on her hand in the fireplace imitate the movement of the aliens closing in on the entrance and creates suspense. Here is my trailer for the in-class activity on August 28th. The films discussed in the “How your smartphone is changing cinema” article and the short by Michel Gondry each use the iPhone in unique ways. I watched the trailer for the film Tangerine and the short film titled Detour and they both try to imitate films that aren’t filmed on iPhones. There are some moments throughout both films that the camera is closer to the actors than it usually is in traditional films. This seems to be a unique feature of creating films on iPhones, which are easier to hold close to an actor’s face than a large video camera. The trailer for the film Starvecrow shows that the film has created something new by using footage clearly shot from the camera of a smartphone. The shots in the film are close to the actors’ faces and they are not as stable as shots filmed on a camera with a tripod. This film feels like it has been recorded in the hands of the actors and from their perspective. An automatism of digital video today is that most cameras and smart phones are smaller than large film cameras and are more mobile. Small digital cameras and smartphones can be used to film in smaller spaces because they allow plenty of room for actors or subjects to move around. These cameras and smartphones can also be held closer to subjects and can create more intimate footage. As a creator, I use digital video for entertainment but I consume media for both entertainment and knowledge. 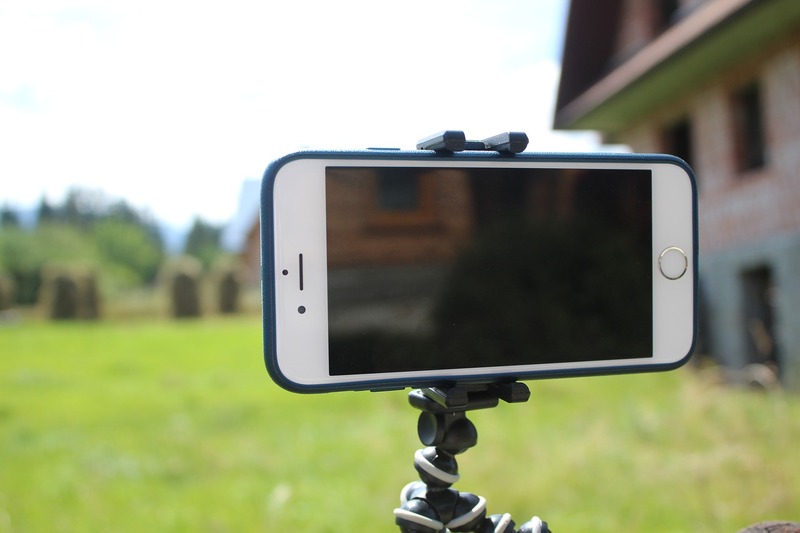 Making digital videos on smartphone cameras is more intimate and can be shared more immediately to large audiences than videos created with other moving image technologies. The ability to make digital videos on our phones makes cinema more accessible. As an expressive form, digital video will become a way to share more peoples’ stories and could make cinema more diverse. This is my first time taking a class that’s primary focus is on video production and I am very excited. I have taken other DTC classes where I have filmed and edited videos but they all focused on other forms of media creation other than video for most of the semester. These classes have taught me the basics of editing videos in Adobe Premiere and After Effects. I also worked with a group of students in my digital diversity class to create a short documentary last semester. I was involved in creating a storyline for the video and the framing of different shots. I like this style of video and would like to pursue this type of editing style in this class. It uses short clips and moves at a fast pace to effectively tell a story in a short period of time. My focus in the DTC program is in social media marketing and short videos like this one are the kinds of videos I want to be able to create as a social media manager.